As we wrap up our final two days here in China I want to thank Dr. Zhang and Dr. King and UMASS Lowell for a truly amazing experience. This trip was all I hoped it would be and more. 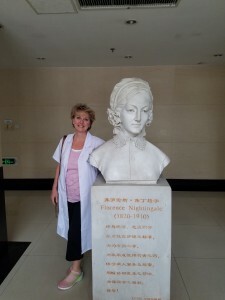 The staff at the Shandong University and at the hospitals we visited were kind, generous and extremely hospitable. It is apparent that they are proud of their advances in Healthcare and yet were also interested and willing to learn from us about our system. 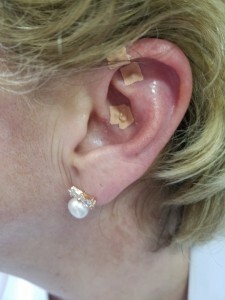 It showed to me that no matter how different we think we are nursing care is the same. Today on our final clinical day we visited the Provincial Hospital and their mission is Excellence, Honesty, Harmony and Kindness with an aim to” Listen to their patients needs and conquer their challenges together”. That really says it all. So as we all look forward to getting back to our loved ones may we all take a moment to realize this amazing opportunity we have been given! 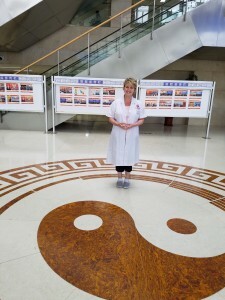 As we begin our final week in China I’d like to share some personal reflections on our experience this past week in the Traditional Chinese medicine hospital. The motivating factor for me taking this trip was my interest in holistic medicine so this was a highlight for me. As we entered the front door of the hospital you could not help but notice the massive Ying Yang symbol on the floor. Balance is the foundation of Traditional Chinese medicine. Moving onto the units I noticed how calm the staff was. The nurses and doctors walked the halls unrushed. It struck me as very different than the halls of my hospital with the overhead paging system squawking and the nurses and doctors walking swiftly as to avoid eye contact with visitors who may delay them by asking for directions. 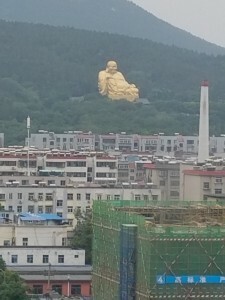 From the hospital rooms you can see an enormous gold Buddha sitting on a mountainside. So now for some first hand data. Being outside of my normal environment and eating different foods had caused me some GI upset. I tried over the counter remedies without success so when the nurses offered “acupressure ” treatment I was happy to volunteer. I’m pleased to report the treatment was successful and I have not had symptoms since. 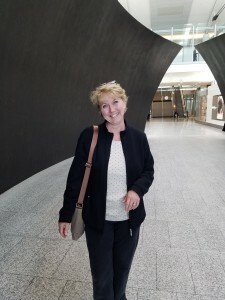 Another interesting discovery was after trying massage, cupping and scraping yesterday, today was the the first time in a very long time I went an entire day without a hot flash. So while it is easy to be skeptical and find other reasons for these personal experiences there is something to be said for treatments that have been around for 3000 years! I definitely will take this knowledge with me back to the US and hope someday we will use more of this therapy as an adjunct to our current practices. My name is Nadine Burke and I have been a nurse for twenty plus years however just recently earned my BS degree at UMASS Lowell. 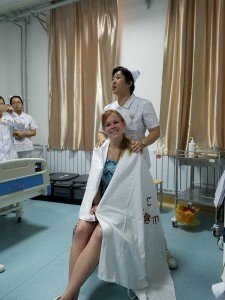 I began taking classes for this degree 5 years ago and never in my wildest dreams thought this journey would lead to learning about global healthcare during a trip to China. I have always been an advocate for eastern medicine and it’s holistic approach to health. I am so excited to learn more about traditional Chinese medicine and the Chinese culture while visiting this intriguing country!